Folders within other folders are often called nested folders. To get a feel for the way nested folders work in OS X, check out the example of nested folders on the Desktop in the following figure. The Desktop is the top-level folder in this example; all the other folders and files you see reside within the Desktop folder. Folder 1 is inside the Desktop folder, which is one level deep. Folder 2 is inside Folder 1, which is one level deeper than Folder 1, or two levels deep. Folder 3 is inside Folder 2 and is three levels deep. 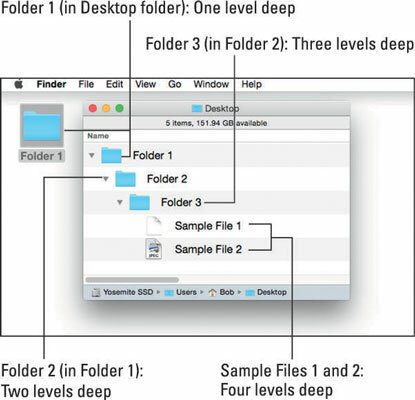 The two files inside Folder 3 are four levels deep. If the preceding list makes sense to you, you’re golden. What’s important here is that you can visualize the path to Folder 3. That is, to get to files inside Folder 3, you open Folder 1 and then open Folder 2 to be able to open Folder 3. Understanding this concept is important to understanding the relationships between files and folders.